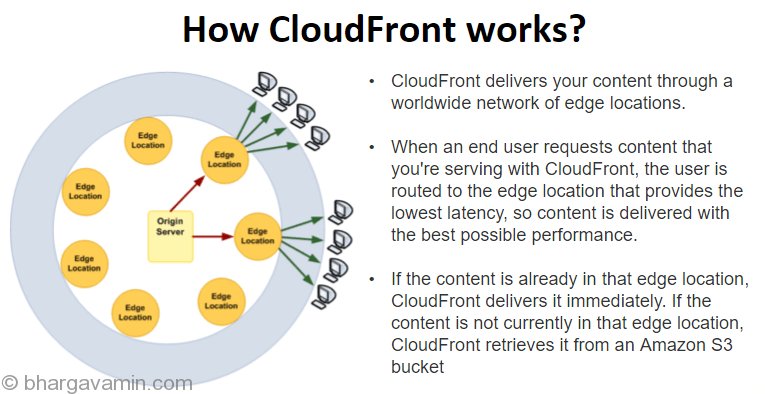 CloudFront is Amazon’s content delivery service. It gives developers and businesses an easy way to distribute content to end users with low latency, high data transfer speeds, and no minimum usage commitments. A content delivery network or content distribution network (CDN) is a large distributed system of proxy servers deployed in multiple data centers via the Internet. The goal of a CDN is to serve content to end-users with high availability and high performance. Management Console : AWS provides a web-based, point-and-click, graphical user interface which lets you manage Amazon CloudFront without writing any code at all. Dynamic Content : Use Amazon CloudFront to deliver all of your content, static content like images,css etc as well as the dynamic portions of your site that change for each end-user. Custom SSL : Use your own domain name and your own SSL certificate to deliver content over HTTPS. Invalidation : It supports the ability to remove files from all edge locations prior to the expiration date set on those files. If you need to remove multiple files at once, you may also send a list of files to remove as a batch. Dynamic Content : You can map a wildcard domain name to your Amazon CloudFront distribution and serve www.example.com, images.example.com, and videos.example.com from the same CloudFront distribution. – Custom Error Pages allow you to serve error pages with your own branding and content. – Configurable Cache Duration for Error Responses allows you to specify how long you want each error page to be cached at CloudFront edge locations. Mobile Device Detection : You can now cache and deliver customized content to your viewers on different devices (e.g. mobile vs. desktop) based on the value of the User Agent header. Geo Targeting : Amazon CloudFront will now detect the country where your viewer is located and forward the country code to your origin server so that you can personalize content for that viewer without changing the URL. Free Tier: AWS customers receive 50 GB Data Transfer Out and 2,000,000 HTTP and HTTPS Requests each month for one year.